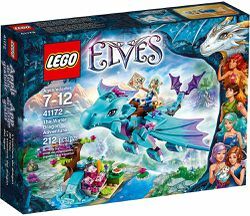 41172 The Water Dragon Adventure is an Elves set released in 2016.
with Naida and Merina to discover new parts of Elvendale! Help Naida Riverheart the water elf, hold on tight as Merina the water dragon, flies around Elvendale in search of new and interesting places! Explore the waterfall while Naida feeds Merina by using her magic water powers to toss food to the dragon. Discover hidden treasures in the magic waterfall, and help Naida brush her hair and try out the other magical beauty accessories before the next adventure! Climb on Merina the water dragon’s back for a flight around Elvendale. Facts about "41172 The Water Dragon Adventure"
This page was last edited on 21 January 2018, at 19:26.